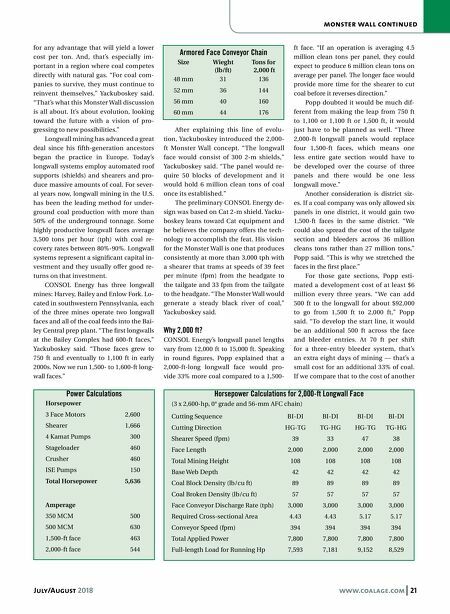 20 www.coalage.com July/August 2018 monster wall Monster Wall: Considerations for the Next Major Leap in Longwall Mining What started as a what-if conversation at CONSOL Energy about 2,000-ft longwall faces may someday become a reality By Steve Fiscor Last year at the Longwall USA 2017 Con- ference & Exposition, three managers from CONSOL Energy gave a presenta- tion dubbed "Monster Wall." Rather than a proper, academic presentation, this was more of a general discussion on the fea- sibility of moving from 1,500- to 2,000-ft- long longwall faces. The three speakers know their busi- ness well and had put pen to paper after talking to CONSOL Energy engineers, in- dustry experts and equipment vendors. Andy Yackuboskey, longwall shift fore- man for the Enlow Fork mine, kicked off the presentation, covering a brief history and the more recent evolution of longwall mining and providing some round figures as to the potential benefits. Chris Popp, mine production shift manager at Enlow Fork, answered the question: Why? The Bailey mine's longwall shift maintenance manager, Jamie Wilson, addressed the technical aspects as far as whether or not this could become a reality. Their conclusion is that, yes, it is pos- sible. The economies of scale are clear. Similar to making the leap from an 1,100- ft longwall face to the current 1,500-ft longwall face, there would be some im- portant considerations that would have to be addressed. Making the Case for a Longer Face The coal operators that survived the last big downturn see the world different- ly from the generation that proceeded them. 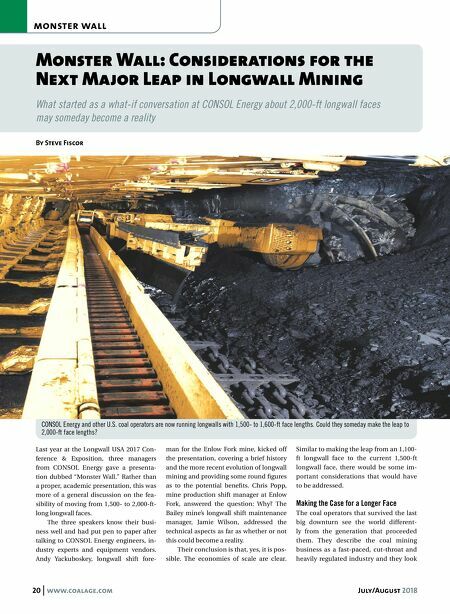 They describe the coal mining business as a fast-paced, cut-throat and heavily regulated industry and they look CONSOL Energy and other U.S. coal operators are now running longwalls with 1,500- to 1,600-ft face lengths. Could they someday make the leap to 2,000-ft face lengths?